Antisemitism or Borscht Belt buffoonery? Capitalistic cannibalism’s the only thing that’ll keep the hungry wolf of economic collapse at bay! Or do the brick house pig’s paintings of mom with umpteen offspring sucking her teats & dad depicted as a cooked ham & sausage links represent some kinda Oedipal complex? 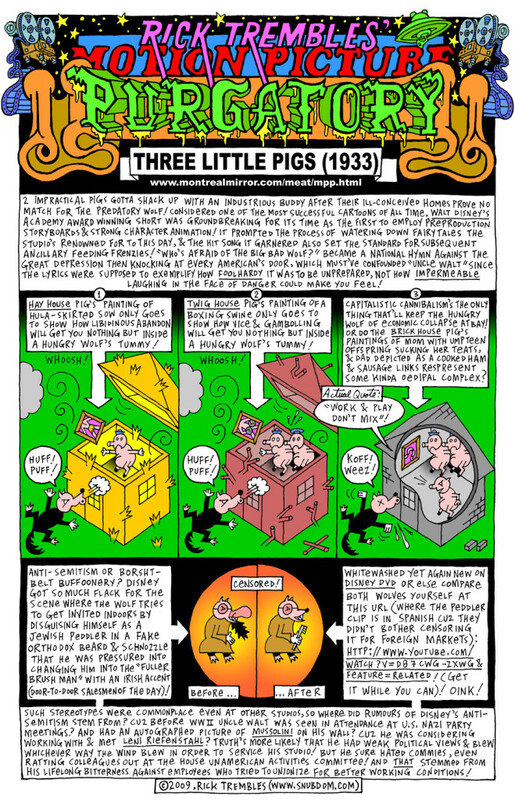 Heading for this Motion Picture Purgatory which originally appeared in a 2009 issue of The Montreal Mirror was “Anthem of anathema for economic collapse!” See the original uncensored version of Three Little Pigs with a “Jewish Peddler” instead of a “Fuller Brush Man” HERE. (To see image below full-sized, click on it to open in a new window & use the magnify function).